THE BOAT RENTAL MANAGEMENT: IT IS WHAT? THE BOAT RENTAL MANAGEMENT: HOW CA MARKET? In accordance with your desires and your budget, we define together your choice (brand and model of boat, equipment). We allow you to establish a financial forecast, using accurate quote including all equipment and the benefits of preparing your future boat. Cash simulations taking into account the revenues and expenses. These simulations are the result of years of experience of operating and maintenance of similar vessels LOA (leasing), funding proposals established by credit institutions selected. A management contract defines the partnership between you and us. You become owner of your boat with the best financial conditions, and with the assurance of a preparation of very high quality. We will seek a basis for your boat, and during the duration of our partnership, your own place until. Your rental income account for 65% of the amount of rental contracts. Our operating flexibility allows you to extensive private use. Nevertheless, it is clear that it must remain in the spirit of the location and preferred sailing high and medium season. The Marina YACHTING company supports all of the costs associated with the rental operation and to the marketing. (Advertisements, exhibitions, secretariat, taken command, systematic cleaning between farmhouses, controls, inventories, put in hand...). Expenses related to the ship, maintenance, revisions, port square replacement due to normal wear and tear not attributable to tenants, you are billed by the Marina YACHTING company. 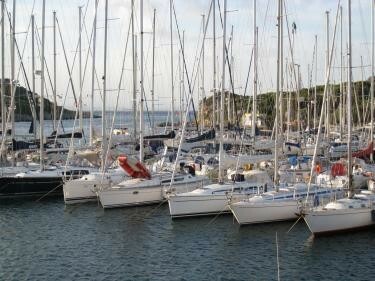 Any loss or damage attributable to the tenants are managed by the Marina YACHTING company. All maintenance is provided by the Marina YACHTING company or sub-contracted by trusted partners. You are absolved of any concern for maintenance, and enjoy your boat upon arrival on board. The operation of the vessel been invoices and statements of regular income making it easy to its follow-up.